Chief Justice of Lahore High Court Justice Ijaz Chaudhry has said that there is no record that Killer of two Pakistani Citizens in Lahore Raymond Davis is a Diplomat. Foreign Ministry of Pakistan has also given this Statement in LHC court that there is no present record that Raymond is a US Diplomat and Raymond was present in Pakistan on Business Visa. Chief Justice Ijaz Chaudhry also said on this Occasion that Court will decide whether Raymond Davis has Diplomatic Immunity or not? 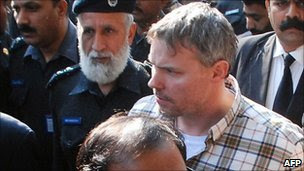 According to media reports the Relatives of Two Pakistanis that where killed by Raymond Davis in Lahore are also getting offers of taking Money for forgiving Raymond. However Relatives are not ready to accept such offers yet. on other hand another American official of US Embassy was arrested on Monday In Islamabad for hitting a Motorcyclist with Car.